Nearly 3 million gallons of saltwater and an as yet unknown amount of crude oil have leaked from a northwest North Dakota pipeline into a creek that feeds into the Missouri River. Officials have called the leak the largest of its kind in state history. The leak in the 4-inch saltwater collection line, owned by Summit Midstream Partners LP and operated by subsidiary Meadowlark Midstream Co., was discovered earlier this month and was reported to the state on January 7, according to Reuters. The pipeline, about 15 miles north of Williston, will be out of commission for an undetermined amount of time, Summit said. Although Williston residents receive drinking water that comes from the Missouri River, the leak does not threaten supplies, according to the North Dakota Department of Health. However, the city has the ability to shut off collection valves to avoid harmful water, Reuters reported. 3-Million Gallons of Toxic Waste Spill in N. Dakota, Maybe Missouri River http://t.co/Mc74UCrA3h But hey! Who needs another river eh? Yet some of the brine made it to the Missouri River, the Williston Herald reported, and the state found "high readings" of contamination at the confluence of the Little Muddy and Missouri Rivers southeast of Williston, according to Karl Rockeman, the director of water quality at the Department of Health. Williston sits in the middle of North Dakota’s oil boom, and the saltwater is said to be a byproduct of hydraulic fracturing, or fracking. Summit is working with the state to find the cause of the spill before it repairs the saltwater line, spokesman Jonathan Morgan said. Monitored by the state's Department of Health, Summit has sent environmental contractors to address the spill, though cleanup will be more difficult given the ice covering much of the area. Reuters reported that about 2 million gallons of water has been taken from the affected streams, yet it is unclear if that amount was mostly saltwater or the creeks’ normal water. The North Dakota Department of Mineral Resources is inspecting Summit’s pipeline network, according to officials, which mostly transports natural gas. Summit recently announced it had agreed with an ExxonMobil subsidiary, XTO Energy, to develop a 'natural gas gathering system' in southeastern Ohio’s Utica Shale. XTO was fined in 2013 for spilling 50,000 gallons of fracking wastewater into Pennsylvania waterways. Summit also operates in North Dakota’s Bakken shale, where the current leak is located, and the DJ Niobrara Shale in Colorado. The Bakken region has seen other chemical accidents, including train derailments, amid the area’s energy boom. 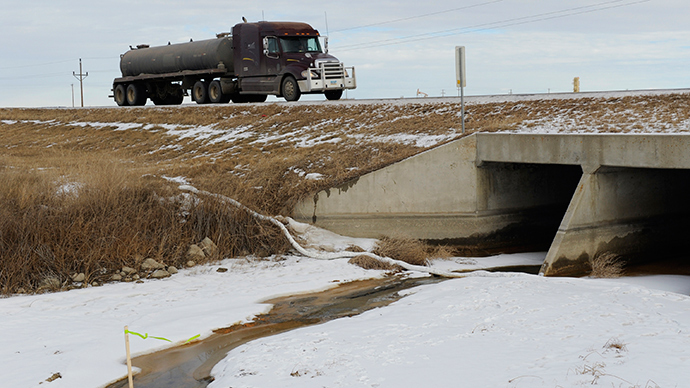 In McKenzie County, a blown-out well leaked a massive amount of fracking wastewater in February 2014. Other states, including California and Colorado, have struggled to adequately address safe wastewater storage. Disposal of fracking wastewater is underregulated, according to Hannah Wiseman, a law professor at Florida State University. In October, a report was released that detailed how a number of US oil companies are taking advantage of the so-called “Halliburton Loophole” to circumvent federal legislation regulating diesel-based fluids in fracking, to dump even more toxic chemicals into the environment. Meanwhile, the cleanup continues in Montana, where a breached oil pipeline spilled as many as 50,000 gallons of crude oil in and around the Yellowstone River last week, threatening drinking water in the Glendive area.